The evolution of the modern lounge suit and its method of wear can be charted historically from the courts of the seventeenth century. It is a history of aristocracy and all the pursuits such a lifestyle entailed, most notably where the suit is concerned with the sport and need for riding. 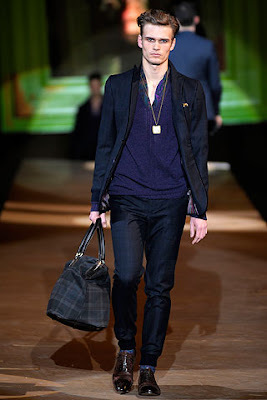 Indeed one can find many features of menswear today influenced from historical requirements now long defunct. Consider if you will the fact that buttons on a man's jacket are traditionally placed on the right hand side, whilst that of a lady are placed upon the left. It seems an inconsequential detail in passing, however when one realizes that this was done to allow the wearer, when the jacket was fully fastened, a swift movement to their sword, which would have been worn on the left side, one takes on a whole new understanding of the button placement. Small functional details remain long after their practical use - take for example, the button on the left lapel of a typical suit jacket, or the buttons on cuffs which seldom actually undo. Towards the end of the eighteenth century, formal wear, that is to say court wear, for a man consisted of the jacket, waistcoat and breeches. Primarily these garments would have been made of silks and embroidered velvets. The jackets would have had rather prominent revers, allowing the jacket to be fully buttoned across whilst riding. This feature can be seen as the basis for the lapels of the double breasted jacket of today. Indeed it is within the riding jacket and breeches that one finds the ancestry of the modern lounge suit. However what I would like to focus on is a secondary feature which arises from the history of the formal riding jacket and breeches of court wear. For everyday wear high leather boots were the footwear of the gentleman. The functionality of country wear was highly influential, from the riding coat, to the riding boot, to the use of gaiters and spats. Originally made from leather, spats were often coupled with gaiters, when worn with breeches and boots, allowing for a covering to the top of the boot and the lower leg. They served to protect the lower leg and top of the boot from mud and dirt. When one considers that even until the Belle Époque that men would often only have the one pair of boots serving as their footwear, looking after such pieces was highly important. Once shoes were looked down upon by the gentleman, and one finds traces of this disregard today, where traditional shoe designs are actually intended to look like boots cut down. A simple pair of lace-up oxford shoes or brogues find their construction based upon that of a boot, and indeed most lace-up shoes are essentially cut down boots in their design and construction. Spats swiftly found their way into court wear, being paired with breeches in a cream or white silk, thus serving a decorative purpose almost diametrically opposed to their original function. However with the introduction of trousers, as opposed to breeches, the wearing of spats soon declined, even more so with the preference for shoes over boots. Indeed it is quite rare, outside of military uniforms and fancy dress affairs, for one to see spats, or even gaiters, being worn today, which I have always felt is rather a shame. Whilst they are not needed for functional reasons, they can serve, akin to a pocketsquare, as a delightful decorative piece. 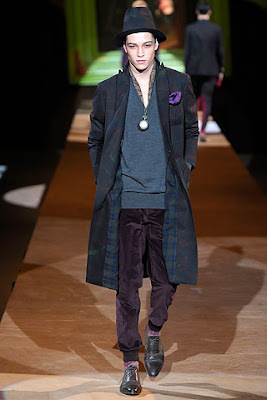 As such it was exciting to see a contemporary take on spats in the Etro collection for this upcoming Autumn/Winter. Taking the inspiration of spats, and indeed gaiters, and their place in country-turned-court wear, the collection took on a luxurious twist to traditional sportswear. In the typical, yet always welcome, flair of Etro, rich colours and patterns were used to provide a nice depth and interest to the looks. Indeed I found myself taken by the wardrobe of the Etro man for this Winter, in particular the spats, and the rich velvets (as many of you can no doubt tell there is something about soft and tactile fabrics that I find irresistible for the colder months). I loved the idea of formal, yet patterned, spats worn over patterned trousers. It provided a streamlined and slim silhouette that was very much of the moment, whilst being unique in its approach of that ideal. It was interesting to see that they were not paired with full suits, allowing for a more everyday feel to their use and wear. Indeed when coupled with the purple velvet coat and pocket watch necklace, above, they seemed perfect for a blustery Autumnal day around London. Alongside the use of spats were also trousers with elasticated cuffs. Whilst there seem to be a plethora of smart-ish joggers and carrot fit chinos with elasticated cuffs in the high street at the moment, it was nice to see more formal trousers with this detailing. They worked particularly well given the sheen and texture of the fabrics used for the trousers within the collection. Indeed to be honest I have yet to be sold on those elasticated cuff chinos - I have only seen them worn in, shall we say, a very Topman way, which is not particularly my taste. 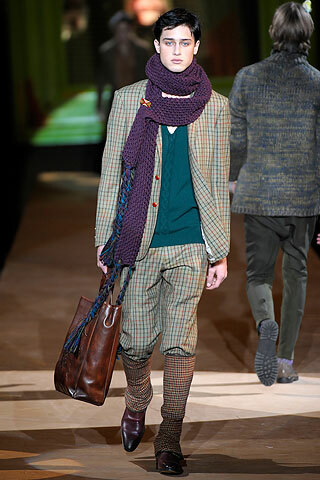 These trousers however I would happily sport, especially with the equally funky Etro socks. 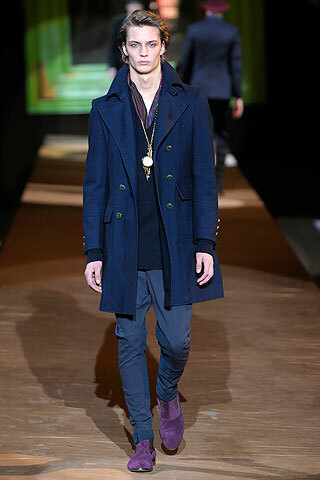 I also rather liked the coats within the collection, which were for the most parts traditional double breasted pieces. The slim cuts, coupled with interesting fabric and lining choices, however provided them a far more unique position in terms of design. I was particularly taken by the styling choice of the coat worn with a silk pochette in the breast pocket. 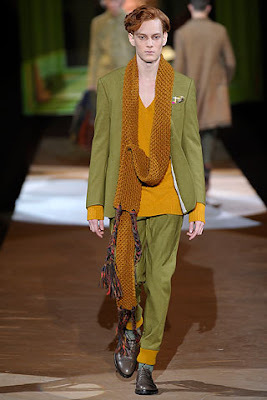 The knitwear pieces were very strong, with long scarves in beautiful Autumnal colours finished with colourful contrasting braided trim. 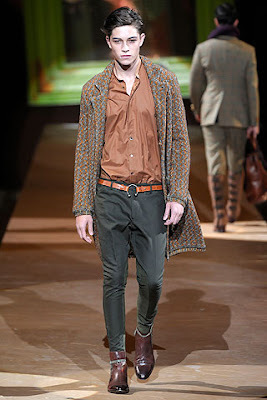 Indeed colour play has always made Etro alluring, and with this collection that fact was still thankfully apparent. Whilst colour tends to be toned down during the colder months, it is always nice to see rich colours so well styled and used. (As an aside more towards the casting and styling decisions, I must say that they paired the colours worn by the red-haired model very well to play against his hair). navy & purple~ luv that combo DK! very carefully thought out post dk! Honestly, Jamie Campbell Bowar should wear some of this designer's collection..except, I don't think he feels the need to dress up much. These are so amazing. I love them. Hard to pick a favorite.